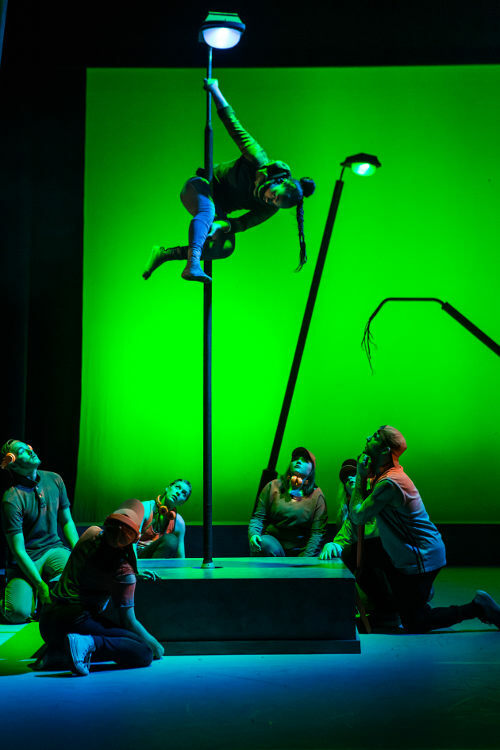 Whether you’re a fan of the Rudyard Kipling original, Disney’s animated version or the more recent life-action release, Metta Theatre’s street dance extravaganza adapted and directed by Poppy Burton-Morgan offers something completely new. 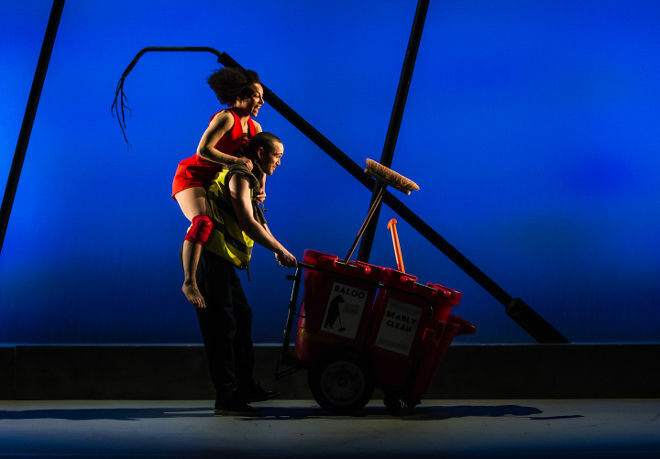 Exploding onto the stage at Bristol Old Vic until 29th July, the set is minimal, the cast compact and the story stripped right back, but the energy is overflowing. Raw, ruthless and stark, the world we enter blurs nature and the urban jungle, with each animal group represented by a different gang. Bagheera (Kloé Dean) is a street artist armed with a spray can, the wolves are skateboarders (Matt Knight and, aptly, Ellen Wolf), and Baloo (Stefano Addae) is an endearingly comical street sweeper. Streetlights double up as trees and crowd control barriers create different areas of conflict and confinement. Costumes merely hint at the characters we’re witnessing – jackets and hoods with strips of fur, or a slinky shimmer of green in the case of Kaa (Nathalie Alison). More striking are the movements employed by each animal tribe – their postures and rhythms immediately let you know the species being shown. Shere Khan, played by the disturbingly flexible and double-jointed Kaner Scott, fills the stage with tension every time he limps on. As the lighting by William Reynolds alters hue to hike up the atmosphere or change setting entirely, he picks up pace to chase a mother wheeling a pram off stage, and the sense of something terrible about to happen is palatable. 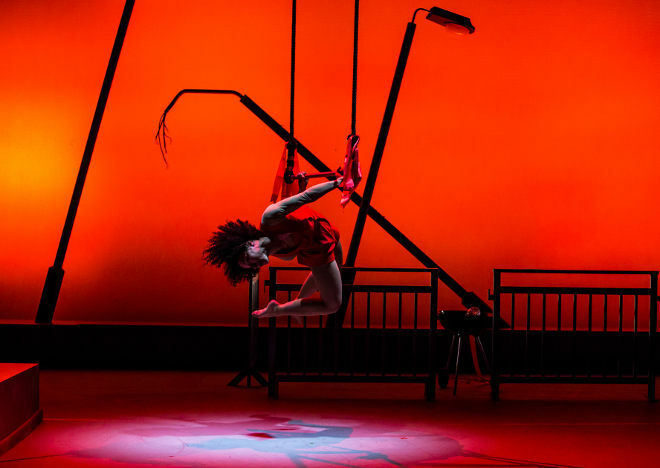 Mowgli, in this instance a girl played by the spirited and charismatic Alfa Marks, brings the opposite mood on stage – bringing humour, light and a great deal of charm. We watch her being tutored by mentors Baloo and Bagheera in the dances that will help her survive jungle life, with each gang having its own particular moves, from sinuous Kaa to the raucous and mischievous monkeys. The suited humans have their own language, depicted through frenetic, almost robotic steps. Their light is also far colder than that of the more feral parts of the jungle, adding another sinister thread to Mowgli’s survival story. It’s all enormous family-friendly fun, carrying us through scene after scene on a wave of sizzling vivacity. The scene where Mowgli tries on different formal clothes and samples a series of formal dances shows off the breadth of her talent as well as heightening the contrast between jungle and so-called civilised living, with a healthy dose of comedy. 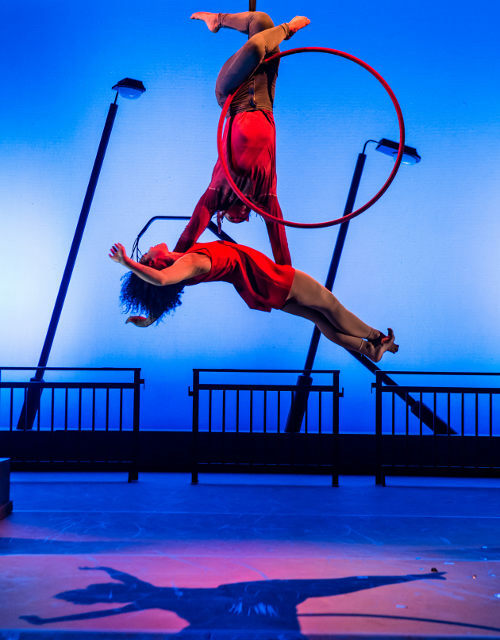 The circus skills, particular those performed by Mowgli and Kaa, are extraordinary to watch, with aerial choreography masterminded by Alfra Marks. This is a performance that reaches beyond words to attain something far more emotive, animalistic and elevated. My only quibble? Mowgli’s closing speech urging us to use our words to stand up for what we believe in. It’s a confusing conclusion to a play where body language takes precedence so powerfully. Jungle Book is at Bristol Old Vic Theatre until 29th July 2017. Find out more at www.bristololdvic.org.uk. All photos by Richard Davenport. This entry was posted in Reviews and tagged Bristol Olf Vic, Jungle Book, Metta Theatre, theatre reviews by Judy. Bookmark the permalink.